Xiameter brand was developed in 2002 by Dow Consumer Solutions to meet the needs of users. The products developed in recent years on the Xiameter line are silicone rubbers, lubricants, silicone fluids and emulsions, polymers for high temperature applications, release agents, resins resistant to high temperature, for liquid silicone molds, defoamers and repellents the water. Dow Consumer Solutions is the world's leading producer of silicon-based technology, with more than 60 years of experience. 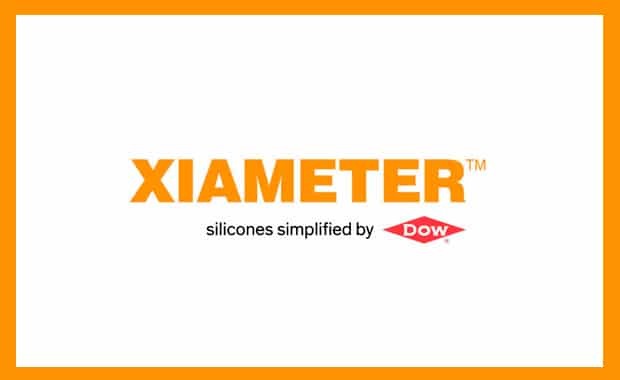 The industry-first XIAMETER® brand from Dow Consumer Solutions brings extra convenience and cost-effectiveness for purchasers of standard silicones. To help prospects in emerging markets understand the extreme versatility and value of using silicone materials in their products, DGE offers the best technical guidance. DGE is a pan-European distributor network for Xiameter silicone products. Through your local DGE member we are able to service your product needs quickly with Xiameter materials from local stock. Furthermore we can support your Xiameter information needs in your language. DGE is also an officially approved Xiameter silicone fluids repackager and has the capabilities and repacking facilities to repack, for example, bulk PMX-200 silicone fluids into smaller 4 kg pail pack sizes.